A blog reader is offering a tree in her front garden for free to anyone who wants to come cut it down and take it away. It is over ten feet tall and she would really like to donate it to a charity who might otherwise need to purchase one for Christmas, but if no charity is interested, anyone who is prepared to come and cut it down. "When my eldest had his first Christmas I bought a potted Christmas tree that was the same height as him, I planted it then to see who would grow the quickest. 13 years on, The tree has won, by many feet! It seems such a waste to just cut/chip it when someone could get some pleasure from it in its final glory! The only reason it's going is because it's span is growing by the minute and will be covering my whole garden soon! Reluctantly going for the chop." The tree is in West Ewell. 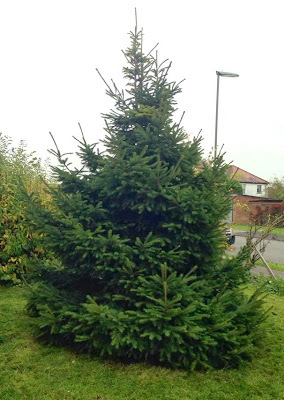 If you would like to offer to cut down and take the tree, please email the blog (mail@worcesterparkblog.org.uk) and I will pass on your details.